Having a smart mobile is necessary today. It makes your life easier. Don’t we all like to update our status and life moments on the go? It just shows how much you are addicted to mobile. For me, mobile is a device that is much more than that. My blog Strokes of Pen is a place, where I update about book reviews, interviews, and stories. For me, being online on desktop or laptop is not easy. Therefore, I like to do it from mobile. I can update my blog on the go and anywhere. Moreover, using app to update my blog makes it easy since most of pics are stored in mobile. Whether I have to add visuals, audio, or both, it makes it easy for me. Nowadays, synchronizing data is common and in just some taps, you can have everything you need to make your blog more wonderful. The coming of apps has really improved over life. · All it takes in one tap to open the app. · Online shopping becomes easy since you can save images and WhatsApp them. No need to download. · You are one tap away from sharing, caring, and spreading. · You can check in and share your imaginations with your friends. I normally use Bloggeroid App to blog. It is quite convenient and I can easily share my thoughts while lazing around or taking rest. I need not necessarily carry my laptop with me. The magic lies in my palm. Therefore, I use many other apps, to order stuff. Myntra being one of them. It is one stop destination for my shopping. And, the recent news that they are completely shifting to app than website has really intrigued me. The flexible and friendly app, gives me delight whenever I login. The UI and UX are very comfortable and there is nothing amiss. 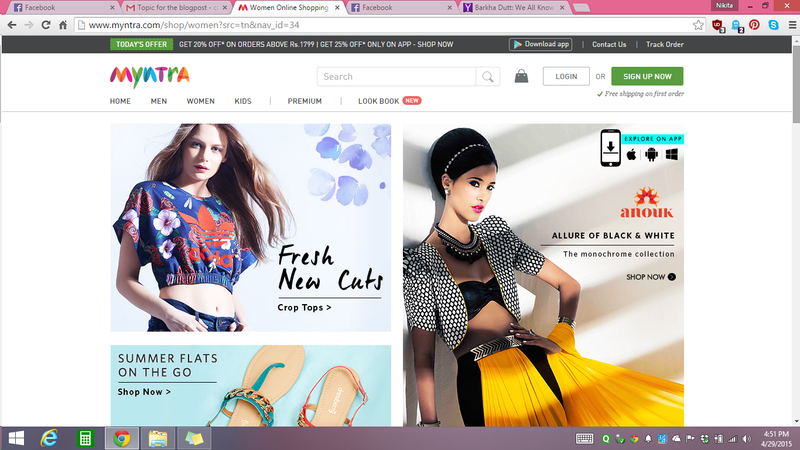 Myntra has literally made a breakthrough by this decision. And, I hope that others take similar decision. Because we are evolving. Earlier everything had to be brought, then everything had to be ordered online and now, everything is just one tap app. Even companies realize that and are busy introducing phones that come with great space. The more the merrier. This is our future and now, all we have to do is welcome it with open hands. What do you think about it? Share with me, in the comments below.